These keep the door shut until the safe is unlocked. Not all safes offer “reasonable” burglar resistance. All Casoro safes have passed the basic UL burglar test. Safe constructed of two layers of steel encasing a composite or aggregate mixture, usually including concrete often mixed with other materials, to provide fire protection. Also known as sheet rock, used to provide fire protection in many safes. Casoro safes use a more sophisticated proprietary light weight concrete instead. Casoro safes use UL tested, “high security” electronic locks. Easy and quick to use; can change your combination when you want to. A mark indicating the product passed a performance test conducted by Intertek. See Intertek below. Resists heat for a period of time. Most Casoro safes provide both fire and burglar protection. Extra hard steel that common tools can’t drill or cut, protects the lock. 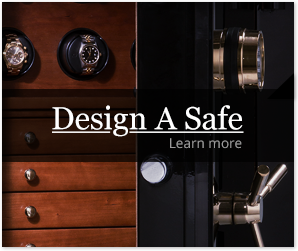 Ask us about increasing the security of your Casoro safe by building it with hardplate. One of the world’s largest testing, inspection and certification companies. Has a network of laboratories across North and South America, Europe and Asia to deliver safety testing and certification for products. The term ETL Mark or Listed suggests the product has passed an Intertek test. The kind that you spin back and forth. Not as easy or quick as electronic or digital locks. A heat-sensitive seal that expands 6 – 10 times it’s thickness when headed to enhance fire resistance. Safe constructed of plate steel and no fire protection. A device associated with the lock that further secures your valuables during certain burglar attacks. Multiple relockers are included on all Casoro safes. UL is the organization in the USA that tests products of every type to establish that certain standards of safety and quality have been met. UL’s tests are expensive, so not all companies are able to submit their products. All Casoro safes earned the UL burglary label. UL is considered to have the most stringent testing conditions and requirements of any US recoginized testing company.